With a weather forecast that has this weekend in the 80’s and showing next weekend to be sunny and mid 70’s one could say that Ocean City, Maryland is experiencing quite the ‘Indian Summer.’ Simply the best way to describe it is ‘ahhhh.’ You would be surprised at the amount of opinions and message boards that discuss what an Indian Summer actually is, so to be clear, we here at the Harrison Group will be applying the Webster’s Dictionary definition to our Fall season. A pleasant, peaceful, or flourishing period occurring at the end of something, is how Noah Webster describes it. Noah and his defining expertise will never fail you. One might say, ‘How did he Noah it would be so nice?’ or ‘Noah way! He is so smart.’ or ‘Noah you didn’t just question Mr. Webster hisself! ?.’ In short, Noah is right. Always. Summer, indeed, came and went and mother nature is still blessing us with something that is quite pleasant. Just like everywhere else on Earth, OCMD is subject to the four seasons, and each one brings it’s own offerings to the table. Winter is preparation, Spring has the promise of ‘what’s to come,’ Summer has all the attention and excitement, but Fall gives Ocean City, Maryland and it’s visitors something that no other season offers. It gives us beautiful warm weather with a warm Ocean to enjoy. Couple that with plenty of room to move around and it could be OCMD’s best season. Just walk out on the beach and boardwalk and you’ll notice a few things. Gone are the crowds, humidity, high heat, burning soles of your feet, the fight for a parking spot… And in it’s place is crisp fresh air, your own personal shoreline and a sky so blue it’ll have you whistling a Sinatra tune. By God, you can even catch a horse and carriage ride on the boardwalk! By far the best time for crabbing (their fattening up for the winter), Fall brings much to do in OCMD. The 34th Mid-Atlantic Surf Fishing Tournament and Corvette weekend are going on right now with the Off-Shore Boat Races this Sunday. Endless Summer Cruisin’ starts October 10th featuring it’s revved up boardwalk parades. A lot of restaurants around town, including our own Hemingway’s (17th St. in the Holiday Inn) and Brick House Pub (67th St. Holiday Inn), feature special menus and deals from October 13 - 27. At the latter part of the month is Octoberfest, complete with a corn maze, pet parade and The Great Pumpkin Race (not sure if Linus will show this year). For those active types, there is a 5K / 10 mile run at the end of October and for the ‘right brainers’ the Fallfest of Fine Art will be held in early November. 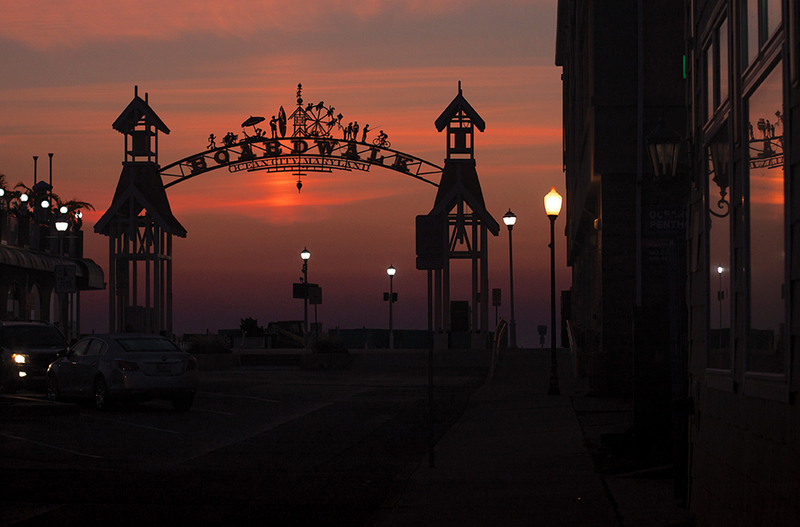 Take a good look at the above photo, the one of the boardwalk entrance. It shows people having summertime fun, doing summertime things. Guess what? And keep this between you and me, but all the activities depicted, they can all be had during the great season of Fall too. Shhhh.